Tesla D: New Model S goes 0 to 60 in 3.2 seconds, has "autopilot" mode. Tesla’s Model S sedan, above, will now come in dual-motor, all-wheel-drive versions (not pictured) and include computerized driver-assistance features. Tesla on Thursday night showed off a new line of dual-motor, all-wheel-drive versions of its Model S sedans, the fastest of which will sprint from 0 to 60 miles per hour in a breakneck 3.2 seconds. That will put it in a class with the quickest production cars on the road. The front and rear motors, Musk explained, will allow a form of all-wheel drive that is more dynamic and sophisticated than the mechanical systems found in conventional, single-engine all-wheel-drive cars. The result will be a more efficient powertrain that can transfer power seamlessly between the front and rear axles, giving the car not only better handling and acceleration but a greater range and higher top speed. Those who read Musk’s tweet will recall that he also promised “something else.” That turned out to be an “A:” autopilot mode. And it is already being added to the Teslas that are coming off the assembly line today. 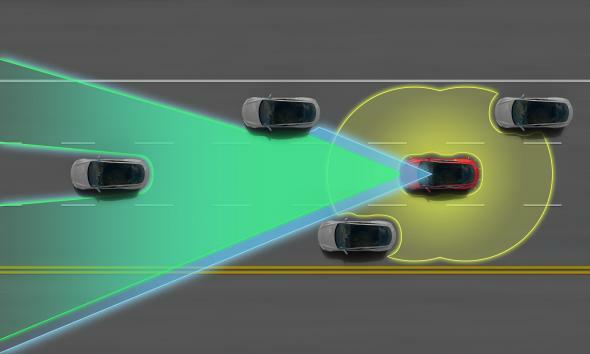 The autopilot system, Musk said, includes a forward-looking radar and ultrasonic sensors on all sides that can sense “even soft objects, like a small child or even a dog.” Among other things, the system will be able to tell “if there’s a car in your blind spot, or if you’ve got a highway barrier on one side,” he added. Tesla is adding autopilot features to the existing Model S sedan as well as the newer all-wheel-drive models. The result will be a car that has the ability to stay in its lane, adjust its speed to match the flow of traffic, and slam on the brakes to avoid an obstacle—all without the driver’s intervention. It will also be able to self-park, Musk said, so “you’ll be able to step out of the car and have it park itself in your garage.” At some point, Musk added with a twinkle in his eye, he’d also like to add a system that plugs the car into its charger automatically as well. Thursday’s Tesla event, held at 7 p.m. Pacific time in Hawthorne, California, got off to an awkward start when USA Today published a story about it more than an hour before the event actually began—then unpublished it without telling readers what had happened. It appeared the paper may have inadvertantly broken the company’s embargo on the news, which was supposed to lift only after Musk took the stage. The snafu came days after Tesla’s vice president of communications, Simon Sproule, left the company after just seven months on the job. UPDATE, Oct. 10, 2014, 12:11 a.m.: Musk didn’t mention the price of the new top-of-the-line P85D during the event, but reports are that it will not come cheap: The Street’s Chris Ciaccia tweeted that it may start at $120,000 to $170,000. The autopilot features, on the other hand, will not cost any extra, and are in fact have already been shipping with all Model S cars produced in the past two weeks. 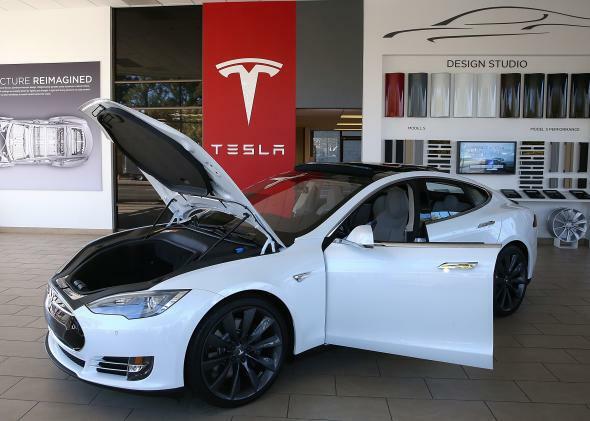 UPDATE 2, Oct. 10, 2014, 9:34 a.m.: The new models are now available for order on the Tesla website, and the prices are not as high as the range cited above. The dual-motor all-wheel drive system adds $4,000 to the price of the two existing trim lines of the Model S, so that the 60D and 85D start at $75,000 and $85,000, respectively, before subtracting a $7,500 federal tax credit. The “tech package with autopilot” adds another $4,250, so that you can get a 60D with both all-wheel-drive and autopilot for under $80,000. Tesla Is Coming Out With Something Called the “D.” Nobody Knows What It Is.